In the summer of 1937, the third convention of the rabbinical leaders of Agudath Israel was held in Marienbad. It was attended by hundreds of rabbis, heads of yeshivas and grand rabbis of Chassidic communities from a number of countries. Rabbi Aharon Kotler attended this convention. 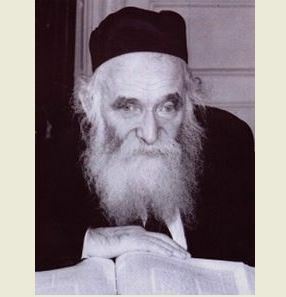 The periodical Hapardes (Year 11, Issue 7) reports that “Rabbi [Elchonon] Wasserman, Rabbi [Aharon] Kotler, Rabbi [Mordechai] Rottenberg from Antwerp and rabbis from Czechoslovakia and Hungary were unanimous in rejecting any proposal for a Jewish State on either side of the Jordan River, even if it were established as a religious state because such a regime would be a form of heresy in our faith in the belief in the coming of the Messiah, and especially since this little Jewish state would be built on heresy and desecration of the Name of G-d."
Whereas the situation of children learning Torah in the Holy Land is in a horrific and frightful condition, with every day worse than the previous one, it requires extensive efforts, and we must stand up at this fateful hour under conditions that never existed in the history of the Jewish People. We would like to present our esteemed friend, the philanthropist ………. who took it upon himself to visit you on behalf of the American Israeli Torah Center. The American-Israeli Torah Center, which was established here at the request of the great rabbis and heads of yeshivas in the Holy Land has the goal of establishing new Torah schools in the maabarot camps and new settlements , and to assist small religious schools in the Holy Land from joining the government-run school system. These schools also are unaffiliated with the government-supported religious school system [Chinuch Atsma’i]. These unaffiliated schools are organized under the American Israeli Torah Center, and include some 5,000 Jewish children who study Torah with reverence as has been the practice throughout history. The government does not interfere in the curriculum, and does not provide even a single cent. This is the foundation of the existence of Judaism for maintaining the Jewish yeshiva schools and the Torah in the Holy Land. Therefore, we ask urgently ask you to assist us to try to create great success for this great and lofty goal, and may G-d fulfill in you the verse Blessed is he who sustains the Torah. May you be blessed with all the best. When Bais Yaakov of Borough Park began teaching classes in Ivrit B'Ivrit (that is, translating the holy words of Chumash into Modern Hebrew), a group of parents complained, until the school staff agreed to present the question to Rabbi Aharon Kotler. The staff and a group of parents (among them the Debretziner Rav) came before Reb Aharon. The staff argued that they had no textbooks besides those produced in Eretz Yisroel, which were written in Ivrit. The parents argued that the purpose of teaching in Ivrit was to inculcate the students with the Zionist ideology. They demanded that the school teach in Yiddish, or at least arrange for separate Yiddish classes. As he listened, Reb Aharon's face grew stormy. He stood up and said fervently, "There is no doubt that teaching in Ivrit is completely forbidden. It is an assimilation worse than all other assimilations in the world. For the goal of Zionism is to uproot the holy Torah from its source. Assimilation with gentiles is like a gentile idol, which can be nullified; but assimilation with Ivrit is a Jewish idol, which can never be nullified! (See Avodah Zarah 52a.) If you teach in English, that is the language of the country and we have no choice, because we need to know the language to earn a living and so on. This is like teaching one's child a trade. But if we teach in Ivrit here in America, it serves no constructive purpose; it is only to bring the children closer to Zionism. Therefore it is definitely forbidden."